I made a mini version of this the other night and it was delicious. My grape tomatoes are coming in like crazy, so I used them and some of my fresh basil. I didn't peel the tomatoes either, cause you really can't peel a grape tomato. This recipe is super easy and I found this recipe on someone's blog and I can't remember whose it was or I would give them credit, cause I did not make this up. Mix mayo, cheese, oregano, salt & pepper in a bowl. 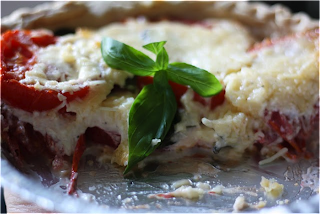 Place a layer of tomatoes in pie shell. Spread half of the cheese mixture over your tomatoes. Then layer in half of your basil. Repeat the layers. Delicious way to use your grape tomatoes. It's like quiche only called pie. Love the basil! I never heard of a tomato pie before, but it makes perfect sense. This is a great recipe and it looks so delicious. With each cheese you get a different taste. Okay, this one's a keeper. Thank you for sharing this. This sounds easy and delicious, Lindalou ... all good summer stuff. Thanks for sharing! Yuuuummmmm! Cheese and tomato's are always delicious together! Homegrown ingredients always taste extra yummy, don't they?!! I've got basil & grape tomatoes too - thanks for a great idea!! This looks and sounds delicious!Thanks for sharing. I'm going to give it a try. We have an abundance of tomatoes and I enjoy trying new recipes. Oh boy, this looks sooo good! I've never heard of tomato pie but this look delicious.